Logon to RDWeb site with just username and password, saves time and confusion for the users. We can make user to bypass typing Domain Name with few easy steps. There is two steps I did. One add “DomainName\” by script and second steps to change the text from “Domain Name\User name:” to just “User name:” in logon page. To do the first step, follow the instructions below. 1. Remote Desktop to your RD Web Access Server. 2. Open Windows Explorer and go to C:\Windows\Web\RDWeb\Pages. Backup webscripts-domain.js file. 5. Modify the above text with your NetBIOS domain name like below: (CONTOSO is my example domain, replace it with yours). 6. Save the file and close the Notepad. 2. Open Windows Explorer and go to C:\Windows\Web\RDWeb\Pages. Backup renderscripts.js file. So it would look like this..
Now user can just provide username and password. Domain name will be added if it is not present. Now it the RD Web access log on page will still display Domain Name\User name:. That can be changed very easily also. Follow the steps below for the second step. 2. Open Windows Explorer and go to C:\Windows\Web\RDWeb\Pages\en-US. Backup login.aspx file. That’s all. If you ever update with RDS patches, you will have to redo these steps again. Hi, do you have found out the steps on a 2012 R2 Server. Compared to the 2012 the renderscripts.js has been redesigned. I have updated my blog with Windows Server 2012 R2 details. Enjoy. I have already changed the 2012 web.config which works for the web login. But there is a second login which I think is coming from the renderscript. Trying to find out where any help would be awesome. We shouldn’t get second login window. If you are getting it then there must be a certificate (websso) issue. What kind of credentials window you are seeing? This works well for internal uses, however users who access from the internet can login OK but the apps fail to launch as it prompts unable to connect. When the internet user enters Domain\Username they can launch the remote apps fine?? Any ideas what else needs to be changed to make this work for RDS users? Single sign-on (windows authentication) will not work from Internet and it can’t possible. My solution is to keep two RDS Web Access servers. One web access server for Internal users with Windows Authentication and Other one for Internet users with Form-based authentication. mmm..I am not sure what’s happening on your RDS Web access server. I want to ask you some obvious question. Thank you for your fantastic blog. I appreciate the detail yet simplicity that you incorporate into each post. This particular post worked perfectly for me. I have also applied the steps from your post about adding the ability for users to change their password. Do you know of a way to change the password.aspx to not require a domain as well? It does not appear to pull the domain from the webscripts-domain.js file. Anand, for whatever reason, the sign out is no longer working after modifying the files as you described. Anything I hacked wrongly???? Adding domain name in the variable should not affect log off though. Do you get any kind of error message or effects? It’s weird. I can click on sign out and just nothing happens.Should I reboot the Web Access server? Yes Reboot the server or just run “IISReset”. Thanks Anand, it’s still not letting me sign out but it’s no biggie. I too have the same problem. Windows 2012 and I cant sign out or use the Help button once I made this change…..? Do you have the Log off link on the page? If Windows authentication is enabled in IIS, there is no log off concept. 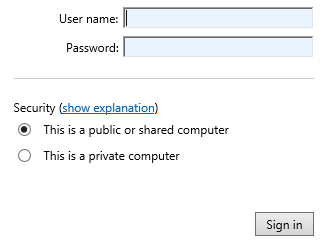 Anand, I am having the same issue as Dennis and Steven on Windows 2012, After making the changes I can sign in without domain name, but it removes the options under Security – the public or private computer radio buttons, the ability to sign out and click help. Works like a charm. But I also wonder if you can get this to work in password.aspx as well? Doesn’t seem to work on either 2012 or 2012R2. Reblogged this on Crawley Obara. At least for 2012 R2, the given solution wasn’t working for me. After the change made, yes, I was able to login to Web Access interface without specifying domain name, but then no published application could be launched, I was getting error message from RDP client. // Ideally check workspace state before redirecting; if it has been authenticatd as well. And then used this function on user name extractions. Then it really works for me. I would like to know whether user account unlock option is enable here or not?